Andrés Caicedo, a Columbian novelist born in 1951, wrote Liveforever (his only novel) in the early 1970s. Liveforever was first published in Spanish in 1977, and on the day of publication, Caicedo received the first printed copy of the book. Shortly afterwards on the same day, he took his own life by way of an overdose of Seconal tablets. Caicedo was twenty-five years old at the time. In the years since his death, Caicedo’s reputation has grown, and he is now considered one of the most original writers in Latin American literature. In his excellent introduction to this Penguin Modern Classics edition of Liveforever (translated into English for the first time), Juan Gabriel Vásquez describes the book as a genuine example of a cult novel – a book passed from person to person, at first through Columbia and later throughout Latin America. Caicedo’s writing pulsates with intensity, reflecting Maria’s frantic search to find herself in this maelstrom. The prose is threaded with snatches of song lyrics, and this accentuates the rhythm in Caicedo’s use of language – there are sections where the prose soars and dances to its own beat. And Frank Wynne has done a terrific job with the translation here, skilfully navigating the slang of the city at the time and maintaining some Spanish words (e.g. pelada meaning ‘little girl’) for authenticity. I read this novel to link in with Richard and Stu’s Spanish Lit month, which is running throughout July. Stu at Winstonsdad’s and Tony Malone at Tony’s Reading List have also reviewed this novel – just click on the link if you’d like to read their reviews. 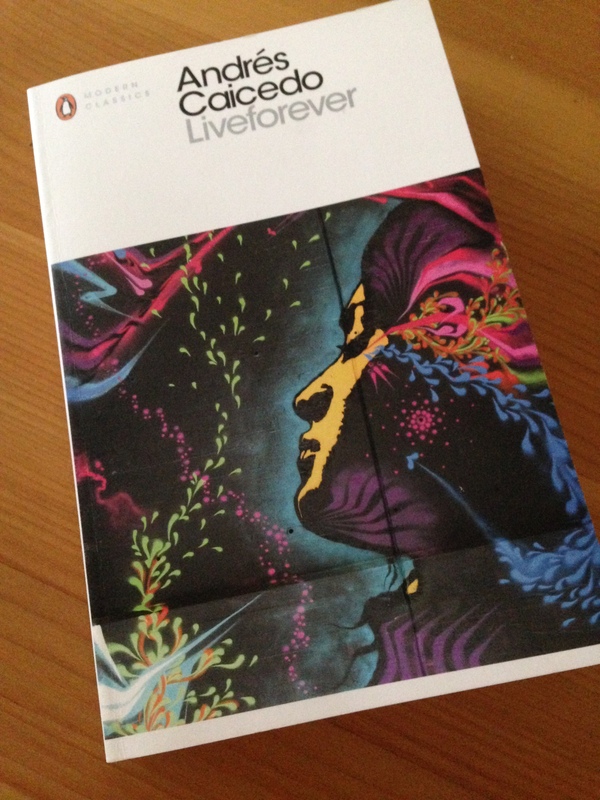 Liveforever is published in the UK by Penguin Books (Penguin Modern Classics). Source: personal copy. This entry was posted in Book Reviews, Caicedo Andrés and tagged #SpanishLitMonth, #TranslationThurs, Andrés Caicedo, Book Review, Colombia, Fiction, Frank Wynne, Literature in Translation, Penguin Books, Penguin Classics on July 30, 2014 by JacquiWine.